How to set up a mobile account, download the app, and a primer on Project Synchronization. Currently available for iPhone and Android devices, the Terrain Navigator Pro mobile app allows you to view your position, collect waypoints, track and routes, record tracks, place markers, and take photos, videos, and sound bites with your mobile device. Through Project Synchronization, markers, tracks, and geopins are automatically shared between projects that exist in the Terrain Navigator Pro desktop software and the Terrain Navigator Pro mobile app. This synchronization occurs through the TNP cloud, which is one benefit of the annual subscription. When you purchased (or installed/upgraded) your copy of Terrain Navigator Pro, you created a web account login. To verify this, open the File menu of Terrain Navigator Pro and choose Preferences, Subscription and User Account. Here, you will see the Username and Password for your account. If the Username is blank, see this article. Once your account has been established, the login will automatically transfer to each computer running the desktop Terrain Navigator Pro that is associated with your Registration account. The Terrain Navigator Pro Mobile App is available at the App Store (for iPhone and iPad) and Google Play (for Android.) Once the app is downloaded, you will be prompted for an account name and password. These are the items that you set up during step one by opening the File menu and choosing Preferences, Subscription and User Account in the Terrain Navigator Pro desktop software. A Project is a collection of layers. By storing your layers (markers, range rings, tracks, etc.) in different projects, you can group and organize your layer data. If you choose not to use projects, all of your layers are stored in one big "Default" project. This is fine if you have a manageable amount of markers, tracks, etc. However, if you collection of layers becomes unwieldy, it is necessary to break it into different Projects. It is required that individual Projects be created, maintained, and synchronized due to constraints with mobile devices and cloud-based storage. If you are not familiar with how to manage your layers with projects, please refer to this knowledge base article. To synchronize layers between the mobile app and desktop software, a common project should be created. On the desktop, use Manage Projects in the Layers (or File) menu to create a New project, select the option to synchronize this project to share it with Terrain Navigator Pro Mobile, and follow the on-screen prompts to create a local PC-based project that is also synchronized to a cloud-based TNP Mobile App project. That project will now appear in the list of All Projects in the TNP Mobile App. If you are out in the field using the TNP Mobile App, a new Project will automatically be created when the first marker is placed, or a track is recorded. You can also close projects, activate existing projects, and create new ones using the various All Projects and Active Project menu items. Any new projects created by the mobile app (and stored on the TNP cloud) should also have corresponding projects created in the PC desktop software, and accessible in Manage Projects. Use Project Synchronization to set up communication between the desktop and mobile versions of the Project. Once configured, changes made on the desktop will be reflected on the mobile device. Likewise, changes made on the mobile app will be shared with the desktop software. Open the Layers (or File) menu on the desktop software and choose Manage Projects and press Setup Synchronization. Change "Synchronize with" to "Mobile Terrain Navigator Pro Project"
You will now see a list of Projects that have been created on the mobile device (if any.) Select an existing mobile project to synchronize (share markers and tracks) with its desktop companion. Or, press New to create a new project on your mobile device, and select it. Press OK.
For the available method, you are generally best off using "Full synchronization". Select it and press OK.
Press Close to exit the Project Synchronization window. Changes made on the desktop software in this project will now be reflected on the mobile device. Likewise, changes made on the mobile version of this project will be reflected on the desktop. Open the Layers menu on the desktop software and choose Manage Projects. In most cases (if the Project Synchronization Preference to automatically create new projects when a new mobile project is added is checked) the new project that was created using the TNP Mobile App (and is stored on the cloud) will have a corresponding Project added into the TNP PC software - with synchronization enabled between the two projects/locations. Double-click the project's name in the list of available projects to activate it, and close the Manage Projects window. If the a PC-based version of the TNP Mobile/Web Project was not automatically created, then create a New PC-based Project, and synchronize it with the one that exists in the cloud. Start by pressing New in the Manage Projects window. Since you have a mobile project already, when asked where to keep this new project, answer I want to synchronize this project to share it with Terrain Navigator Pro Mobile or other users. Next, indicate that you would like to establish full synchronization between this project and a Mobile Terrain Navigator Pro Project, and that you want to synchronize with a mobile project that you have already created. You will now see a list of Projects that have been created on the mobile device. Select the existing mobile project to synchronize (share markers and tracks) with its desktop companion. Press Next. You will now be able to name the PC-based version of this project. Note that because this project is stored separately from its cloud-based counterpart, it could also have a different name. However, in order to avoid confusion, it may be best to match the name of the PC-based project with the name of its cloud-based companion. Press Finish, and the new PC-Based project will be created and synchronized with its cloud-based counterpart. Changes made on the desktop software in this project will now be reflected on the mobile device. Likewise, changes made on the mobile version of this project will be reflected on the desktop. Currently, the layers supported by the Terrain Navigator Pro mobile app are limited to Markers, Tracks, Routes, and GeoPins. Thus, only these types are synchronized between the desktop software and the mobile app. Moreover, Routes can only be sent to the device for display, but can not be used for point-to-point navigational purposes. Synchronization is limited to the core elements of each layer: name and position. Additional elements (color, symbol used, etc.) are not shared. For a detailed discussion on Projects and Project Synchronization, please see this knowledge base article. Check our YouTube Channel for training videos. Examples include Key Features of TNP Mobile, Cross Platform Integration (desktop, mobile and web) and basic Project Synchronization. Note that an active subscription is required to access the cloud storage area employed by the Terrain Navigator Pro mobile app. This same subscription includes access to the other web-based features of Terrain Navigator Pro, such as aerial photos, automatic software updates, alternate map/photo editions, etc. Should you wish to renew your subscription after the initial year, please log into your Registration account, or call us at 800-627-7236. The Synchronization Method is determines how Terrain Navigator Pro should interpret changes made to the layers in a synchronized project. In it's most basic configuration, Full synchronization, any change (addition, modification, or deletion) made in the Terrain Navigator Pro will be reflected the Terrain Navigator Pro mobile app. Likewise, with Full synchronization selected, all changes made in the mobile app will be received into the corresponding project. In most cases, Full synchronization will yield the desired (or most understandable) results. Move a marker in the Terrain Navigator Pro desktop software, and it will also move on the Terrain Navigator Pro mobile app. Delete a track in the desktop version of Terrain Navigator Pro, and the track is deleted on the mobile app. When you select a Synchronization Method, a description will appear that explains the conditions under which changes (additions, modifications and deletions) will occur. Some are "one way" (into the desktop copy of Terrain Navigator Pro only or sent out from it.) Others, such as Full synchronization, are bi-directional, and changes pass freely between the desktop and mobile app. As you can see, these various synchronization methods can be very technical in nature. However, they are extremely flexible and allow for very interesting possibilities. 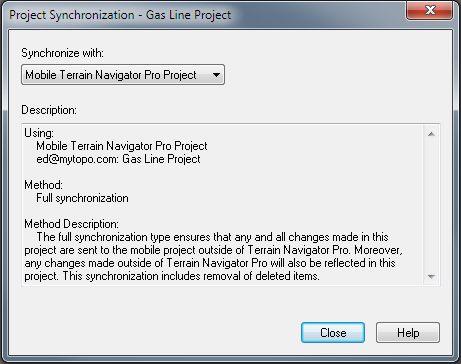 A complete list of Synchronization Methods can be found in the Help document that accompanies Terrain Navigator Pro. The desktop for Terrain Navigator Pro can be set to automatically create projects on the desktop whenever a new project is created on the mobile device. Likewise, it can be set such that whenever a new project is created on the desktop, a companion project will be created on the mobile device. These options, which are initially disabled, are available in the desktop software by opening the File menu and choosing Preferences, Project Synchronization. When this option is checked, a new project in the Terrain Navigator Pro PC desktop software will be created automatically whenever a new project is created in the Terrain Navigator Pro mobile app. For example, if you create a project titled "today's hike" on your iPhone running the Terrain Navigator Pro mobile app, and the "automatically create new projects when a new mobile project is added" option is enabled, a new project titled "today's hike" will automatically appear in the Terrain Navigator Pro desktop software in the list of My Projects. This project will be synchronized automatically, using the Full Synchronization method. Note that this preference is enabled automatically by default as it provides the functionality most TNP customers will expect - creating a new project on the TNP Mobile App will create one on the PC desktop too. Press this button to cause the Terrain Navigator Pro desktop software to look on the cloud to see if any new projects have been created by the Terrain Navigator Pro mobile app. If any new mobile projects have been created, a new project for each will be added to the list of My Projects in the Terrain Navigator Pro desktop software. These new projects will be synchronized automatically, using the Full Synchronization method. When this option is checked, a new project will be added to the Terrain Navigator Pro mobile app whenever a new project is created in the Terrain Navigator Pro desktop software. For example, if you create a project titled "tomorrow's hike" in the Terrain Navigator Pro desktop software, a new project titled "tomorrow's hike" will automatically appear in the Terrain Navigator Pro mobile app in its list of My Projects. This project will be synchronized automatically, using the Full Synchronization method. If you have a large collection of mobile projects that you do not normally want to synchronize with the Terrain Navigator Pro desktop software, or if you have a large collection of projects in the desktop software, it may be best to keep the options for automatic project creation turned off. The options for account management are accessed through the desktop software by opening the File menu and choosing Preferences, Subscription and User Account. The login information for your Terrain Navigator Pro mobile app will be displayed here. Use this information to activate the iPhone or Android app on your mobile device. Each registration of Terrain Navigator Pro is entitled to a single, unique account. This account is linked to your Registration account. Note that once this mobile account is created, it can not be changed nor assigned to another Terrain Navigator Pro registration account. 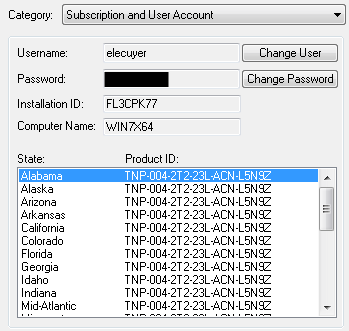 If you are deploying Terrain Navigator Pro in a multi-user environment, and a single Registration account were to be used, this single mobile account login name (and password) would be assigned to all users. If you would like to have Terrain Navigator Pro in a multi-user environment, please contact us regarding Terrain Navigator Pro Enterprise. Should you wish to change the password that accesses your already existing mobile account, please visit https://www.terrainnavigator.com/Customer/ForgotPassword. Note that changing the password will affect all other copies of the Terrain Navigator Pro desktop software in use in your account as well as all copies of the Terrain Navigator Pro mobile app. For example, if your installation consists of two copies of the Terrain Navigator Pro desktop software (running on two different PCs) and an iPhone app, changing the password on the web site will disconnect the synchronization with the both PCs and the iPhone until the new password is entered on each PC and the iPhone. Because the TNP Mobile app is not as advanced as the desktop software, there are several types of layers that can be displayed and used in the Terrain Navigator Pro desktop, but are not available in the TNP Mobile App. These include polygons, overlays (imported GIS data), range rings, and range bearing lines. At this time, these layer types are not able to take advantage of Project Synchronization for sharing with the TNP Mobile App. However, each of those layer types can be used to create a route or track (or in the case of overlay point objects, markers.) In the Terrain Navigator Pro desktop, right click on the any of those layers, then select Create, Track (or Route/Marker.) This will create a track (or route/marker) that can be synchronized with the mobile app for display. Terrain Navigator Pro is enterprise-aware. Simply put, this allows flexible licensing of multi-user environments, and multiple accounts for mobile data collection and team tracking. Simply purchase additional team mates (users) for your TNP account which can be done on our website, or calling 800-627-7236. At this time, an iPad-specific version of the Terrain Navigator Pro Mobile App is in development. However, the iPhone version of the app has been tested on iPads that feature a built-in or external (bluetooth or similar) GPS. iPads with a built in GPS (or connected to an external GPS) will run the iPhone TNP mobile app. iPads without any GPS are not able to run the iPhone TNP mobile app. Click here if your are interested in "voting" for the iPad App. Note: The TNP mobile app is listed as an iPhone app in the App Store. If you are looking to run the iPhone version of the TNP Mobile app on an iPad, be sure to search for it in the iPhone section of the App Store, as opposed to the iPad section. To allow searching for iPhone apps using iTunes, click the "iPad Only" dropdown and select "iPhone Only".